My kids seem to think that when a skill comes easily it means you’re good at it—you’ve reached a level of success. Ironically, it’s a good thing I no longer believe that myself, because if I did, I would have to conclude I’m a complete failure at parenting. 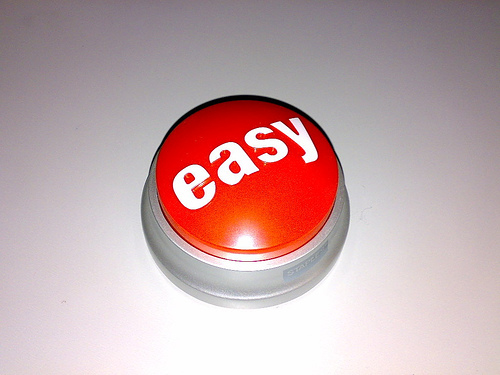 Of course, I have shared my kids’ assessment of “easy = good” in the past. Long ago I decided if writing is easy and math is hard, I must be good at writing and bad at math. If playing the viola is easy, but only up to a point, I figured when it became hard I had reached the limits of my talent. There is some truth to this logic, which is, I suppose, why we attach ourselves to it in the first place. I have no doubt, for instance, that my natural gifts are in writing, but that doesn’t mean that I couldn’t get much more skilled than I have in math or music. Because here’s what I’m finally starting to get: It’s when something gets hard that it’s getting real. The hard moments are those breakthrough moments, when you either get stuck or push through to a new level. Right now, the hardest thing in my life is parenting. Jason and I have been sort of coasting these past few years—no big challenges or concerns, no weighty issues to sort through. I have to admit, it sort of felt like we had figured a lot of this parenting thing out, and we had gotten lucky, too, with generally good, happy, problem-free kids. But now, our kids are 15, 14 and 12, and suddenly nothing seems to be coming naturally for me as a mom. Every day brings conundrums—issues to sort out, consequences to weigh, doubts to push back into the shadows. I second-guess myself at every turn, trying to choose my battles and decide which message or lesson is most important in any given situation. That my daughters respect me? That they know I love them? That they’re safe in this moment? That they’re learning things that will keep them safe down the road? That they’re learning responsibility and respect for others? Of course, we want all of those things in equal measure, but in real, day-to-day situations it seems like something always has to give. As parents, when things get hard we don’t just throw in the towel, like we might with a musical instrument or sport. But it is easy, I think, to get stuck. It’s easy to let things slide, to not follow up, to decide to keep an evening at home peaceful and pleasant rather than bring up difficult issues. It’s easy to try forcing our kids (or at least our concepts of them) into one-dimensional packages that we can more conveniently handle. And there’s that other, less neutral side of easy, too: It’s also easy to just yell, to take away privileges in a rash way, or to be passive aggressive in our communication of frustration and disappointment. It’s becoming crystal clear to me, as a parent of adolescents, that easy parenting is not synonymous with good parenting. In fact, if parenting feels hard, it’s probably a better sign that you’re doing a good job. Because parenting is complex. Individuals are complex. Relationships are complex. The world we’re raising our kids in is complex. Why on earth would we expect—or even hope for—any of this to be easy? That’s why I’m trying to let go of “easy” and “hard” as measures of how things are going. Instead, I’m going to ask myself, “How real is this?” How real is this relationship? How real is the writing on my blog? How real is my life? [Real is] my relationship with my daughters, always situated somewhere between knowing them too well—every small fault and quirk—and never being able to know them well enough, to the full depth of their beings, the full capacity of our love. And you better believe that’s hard. It’s hard, and absolutely necessary. OK, I’ll post my funny comment first before I get real with you… Have you seen the music video on YouTube: “It’s gettin’ real in the Whole Foods parking lot”? That was in my head as soon as you mentioned being “real.” Ha! You’re absolutely right that resistance can be a good sign. It’s like fighting through the pain of physical therapy. You don’t want to hurt your muscles, but you need to stretch them and build them up again. That’s a huge lesson for me in Christianity. Spiritual resistance sometimes means I’m on the right track! oh yes. no kids here, but finding hard stuff in other places and wanting to throw in the towel, but yes, if it’s hard, it might be that it’s growth. Thanks for this post, I needed the reminder, as I fight my own battles. ed, that’s so funny—I hadn’t seen it before. And the physical therapy metaphor works really well, here, and applies to something else I was wanting to get at: Things can hurt or be hard and still be signs of progress, but only to a point. Obviously not all pain/struggle moves us in the right direction. I’m sure physical therapists are always on the lookout for pain and effort that reverses the progress. sarah louise, the parenting issues brought me to this general realization, but it definitely applies to so many other areas of my life. Keep up the fight (but also be on the look out for the sorts of red flags that I mentioned in my response to Ed—too much struggle might be a sign that some new strategies are in order). So totally relate to this and am living these hard years. (11, 13, 14 and 23) Thanks for the good reminder that easy does not equal good. Before I had reached the end, I decided I would tell you that Real is Hard, and then you pull the old one-two and beat me to it. No surprise there, wise one. I think all the years as parents are hard, delicious, easy, demanding, relaxing, tense, messy, tidy piles of our best love thrown at them with abandon and purpose. You know that when you are asking how to be a better mama, the fact is, you are already doing a pretty amazing job. I wonder if adolscence is more for parents…so that we will be ready for them to fly? (Which is also not easy. ).